Dog Ear Publishing releases “Why the Long Face? A Story About Thumb Sucking” by Dr. Todd Morgan. A board-certified expert with his own dental practice describes the all-too-real consequences of thumb-sucking on a child’s health and development in this new picture book released by Dog Ear Publishing. Although thumb sucking can be a soothing activity for babies and young children, its effects are anything but soothing to the body. In fact, thumb sucking can affect craniofacial growth and development of airways, hindering functions such as breathing, speaking and swallowing. This new book by a dentist details the effects of thumb sucking on growing children to help parents recognize early symptoms so they can avoid problems with their child’s health. “Why the Long Face? A Story About Thumb Sucking” stars Gracie, a smart girl who knows a lot of things but not the problems that sucking a thumb can create. Gracie isn’t worried that her constant thumb sucking makes her smile crooked or might make her face long. After all, her pony Alice has a long face and looks beautiful. When she visits her dentist, Dr. Morgan, Gracie and her parents find out how much damage a thumb can create, including making it harder to breathe at night. A fateful dream changes Gracie’s mind about the pleasure of sucking her thumb. Colorful watercolor illustrations by Manny Aguiler and a list of helpful organizations and websites round out this resource for any parent with a thumb-sucking child. Author Todd Morgan, an internationally recognized expert in dental sleep medicine, has a practice in Encinitas, Calif. He graduated from the Washington University School of Dental Medicine in St. Louis in 1985. Morgan is board certified in dentistry and dental sleep medicine and has completed clinic research studies and published scientific papers on treating snoring, sleep apnea and headaches with dental devices. He and his wife, Barbi, have four children. For additional information, please visit www.thumbsuckingbook.com. Dog Ear Publishing releases “Go Ahead and Break Your Child’s Heart” by Bob Springer. 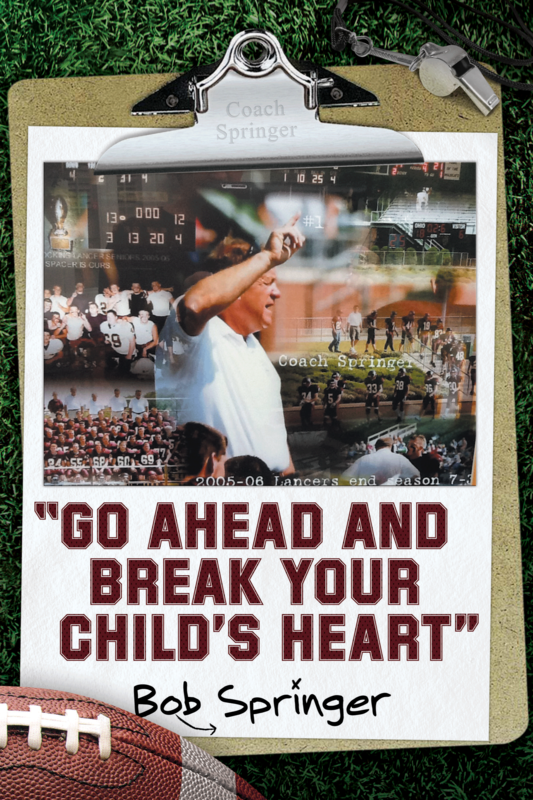 A retired high school football coach offers tips for parents to help their children succeed in this new book released by Dog Ear Publishing. Successful parental leadership is the key to winning or losing on or off the athletic field. That’s the claim in a new book written by a former high school football coach and human resources executive. Bob Springer aims to provide parents and leaders of student athletics with a new perspective on managing middle and high school athletes. Fictional stories within the book illustrate different styles of leadership designed to help parents raise children to be successful. “Go Ahead and Break Your Child’s Heart” urges parents to step into that role proudly, providing guidance and discipline when needed instead of avoiding hurting their child’s feelings or being worried they can’t spend time with friends. Springer refers to this as putting kids first, writing that although both adults and peers are critical in shaping student athletes, “the role of the parent is that of the critically important glue: the record keeping, celebrator and disciplinarian.” A series of Leadership Considerations lets parents assess and develop their own leadership style. Springer urges parents to use tough love on their children when necessary, asking them to maintain and exceed performance standards in order to keep their students on the path to a winning life. Author Bob Springer retired in 2011 after coaching high school football for 14 years in Ohio and West Virginia school systems. He coached teams to the state championship and earned Coach of the Year honors at another school. He served as assistant coach and head coach after retiring from Allstate Financial, where he spent 26 years, eventually becoming Vice President of Human Resources. Before Allstate, the 1964 Marietta College graduate had coached football for five years. For additional information, please visit www.bobspringerbooks.com.